Now, I have ranted about the unavailability and expense of NZ wine in the past, only to be told it’s easily available in Shenzhen, but that was a long time ago and I’m not sure where I posted that rant. I’m also sure that, given the apparent Shanghai focus of NZ’s business community (judging by emails from KEA), that NZ wine is more easily available in Shanghai than in Beijing. But here’s what I see: I see plenty of dairy companies sourcing their milk powder from New Zealand or wishing to create the impression that’s where they source their product playing up the 100% pure, clean, green, pollution-free NZ angle; I see Air New Zealand placing ads featuring photos of absolutely stunning scenery in local newspapers (bottom left quarter of the page, you may need to squint, but it definitely has the phrases ‘100% Middle Earth’ and ‘100% New Zealand’ in the top left of the ad and a koru and ‘新西兰航空’ (Air New Zealand) in the top right); I see Zespri (who’ve found themselves in their own spot of bother lately – and the only quibble I have with that article is that Fran O’Sullivan doesn’t elaborate on the lessons Zespri and NZ exporters to China gernerally have to learn from Zespri’s experience) getting their kiwifruit prominent displays in the fruit and veg sections of supermarkets, I see Anchor butter served up with the bread at banquets in the Great Hall of the People (only wangled that 3 times so far… ), I see NZ lamb on the menus of restaurants pitching at an affluent, sophisticated, or at least aspiring market (though information I have recently heard suggests that if that is genuine, it may well be grey market… no time to chase that up so far, but I’ll be looking into it) and I see the imported wine sections of supermarkets either big enough or specialised enough to bother with such things chock full of wine from all the major wine-producing countries, old world and new – France, Spain, Italy, Portugal, the US (California at least), Chile, Argentina, South Africa, Australia – everybody but New Zealand. What I very rarely see is New Zealand wine on supermarket shelves, and when I see it it is absurdly expensive – though I must admit I haven’t seen any since the tariff was cut to zero. What I never see is any attempt to promote New Zealand wine. Alright, fine, that may be because I’m in Beijing and not Shanghai or Shenzhen or wherever. But for crying out loud, free trade agreement, zero tariffs, and a reputation for clean, green, pollution-free produce still miraculously intact despite the missteps of our major producers and an ever-growing market for wine. Why isn’t the NZ wine industry challenging “Chateau Changyu”‘s ads playing up faux-European sophistication with a “Yeah, right, but we’re guaranteed quality and clean“? To be fair, I am working off pure anecdata here, nothing to pass peer review, and it certainly seems from the evidence I have to hand that Invivo, at least, “gets it” and is working at building up its market here. But “Brand New Zealand” or “New Zealand Inc” wine division? MIA so far as I can tell. No, DCD milk is not out of the news yet, but it may be calming down – certainly didn’t see anything new about it today, just a few more rehashes of old stuff. Maybe Fonterra’s really lucky. We’ll see. Xinhua reports that in 2012 Chinese demand for imported New Zealand cows increased dramatically. According to statistics released by Statistics New Zealand the day before yesterday [note: January 31; the article is dated February 2], in the first 11 months of 2012 New Zealand exported a total of 3823 dairy cows to China with an export value of 100 million New Zealand dollars (around 520 million RMB), while in the same period in 2011, New Zealand exported 24934 dairy cows to China, with a value of 63.2 million New Zealand dollars (around 330 million RMB). The statistics show that in the first 11 months of last year, New Zealand exported a total of 43517 dairy cows with a total export value of 112 million New Zealand dollars (around 587 million RMB), and China is New Zealand’s biggest dairy cow export market, taking 88% of its exports. And that’s it. Ok, so that’s bad news from an animal welfare point of view if you’re the Green Party. I’m not sure it’s good news for China’s environment, given how much water dairy cows need and how much waste they produce. But China’s obviously very keen to improve the quality of its dairy herd, and that’s a lot of money finding its way to New Zealand. But exporting live cows does seem a rather short term strategy to me. Surely at some point China will have enough to both boost the quality and amount of milk production and breed its own top quality dairy cows, and if China is producing its own top quality milk, surely demand for New Zealand-produced infant formula will gradually drop – assuming China’s dairy companies manage to regain the trust of Chinese parents, of course. Still, Fonterra mishandling food safety scares could help with that. And I thought, huh? Some New Zealand products successfully built in China for the first time? Which products? And how would this make sense even if I knew which products? But reading the article, it became clear that this 新西兰部分产品/”some New Zealand products” is actually the name of a company or organisation. A strange name for a company or organisation, but it must be a name, because a proportion of products from any country doesn’t generally announce things – companies, organisations and people do. So a bit of googling, and it took a while, but I suspect this 新西兰部分产品 might be Fonterra. Why? 恒天然 is the usual Chinese name for Fonterra. It’s got that 部分产品, but the context suggests that’s part of the company name rather than “some of Fonterra’s products”. 魏柯文, greater China director of this mysterious company, is the same name as given in the first article (although the first article doesn’t give a title or job description), and a little more poking around found me this Caijing article from December in which “恒天然大中华区和印度区总裁” – Fonterra Greater China Region and India Region director 魏柯文(Kelvin Wickham) is interviewed. So how did Fonterra become 新西兰部分产品? Sure, their New Zealand products count as some New Zealand products. But 新西兰部分产品 is a really strange and misleading name for a company. But they seem to be sticking with their old Chinese name 恒天然 on their website, so I doubt this is some weird and ill-advised attempt to dodge the DCD flak. So if that article and that post are reporting Fonterra’s deeds in Hebei, then it would seem we have quite a spectacular case of ‘lost in translation’. Either that or a company in the same line of work with a boss with the same Chinese name as Fonterra’s China and India boss is also building massive dairy farms in Hebei, but made a spectacularly poor choice of Chinese name. Nah, I think lost in translation is more likely. I wonder if somewhere out there there’s an article headlined “新西兰恒天然公司部分产品首个在华牧场顺利建成” and through a process of careless copying and pasting, the all-important 恒天然公司, the actual name of the company, got dropped out and Fonterra was renamed. Google doesn’t seem to think so. Maybe it’s a copyediting problem. Either way, it leaves me wondering how trustworthy the figures reporting what strikes me as being pretty huge scale dairy farm construction in Hebei’s Yutian county. It’s not the first article I’ve seen reporting farm construction on such a scale, but if they can make such a glaring error in the name of the company, who knows what else they’ve done. Still, Caijing did report in December last year that Fonterra plans to have 30 farms in China by 2020, and that China is now Fonterra’s largest export market, taking 16-17% of Fonterra’s New Zealand-made products and accounting for 12-15% of its sales. So maybe there is some truth to the huge numbers reported for their farms in Hebei. Who knows. Hey, MPI, Fonterra, what are you doing? Whatever it is, it certainly does not seem to be enough. Seems alright, right? Yeah, until you read the article. The opening sentence is a brief recap of the situation, but ends by stating Fonterra “kept it secret” for more than three months – and yes, with scare quotes. Why scare quotes? I’m not sure, but it does seem to draw attention to the “kept it secret”. But I suppose there is a difference between an active hush-up and simply neglecting to inform anybody. But which was it? I don’t know, but I’d agree that the length of time between the discovery of DCD in some dairy products and the revelation of that discovery to the public certainly looks suspicious. According to reports, the DCD in New Zealand milk powder came from soil pollution. Some farms in New Zealand sprayed their pastures with fertiliser containing DCD, and after cows ate the grass, the milk they produced was polluted. Although the New Zealand government has responded, saying that only a few milk powders were contaminated with DCD, and it poses absolutely no threat to food safety, because New Zealand is the world’s biggest dairy exporting country, this issue has caused many countries to be worried. See that word ‘污染’ – pollution or to pollute – used in each of the first two sentences, first as a noun – soil pollution – and then as a verb – milk they produced was polluted. And what really big issue plagued China through the first month of 2013? A severe air pollution crisis. What has been a major theme in the marketing of New Zealand dairy products in China? That’s right, clean, green, 100% pure, pollution free. Uh oh, New Zealand is no longer pollution free. There’s pollution in the soil and milk. I also find the last sentence interesting in how it ends with “world’s biggest dairy exporting country” and “many countries worried”. It certainly seems to me to emphasise that MPI’s assurances that only a few products were contaminated with amounts of DCD so tiny that nobody’s health was ever at risk are simply not good enough. You’ve told us this, but hey, this is a big deal and we’re still worried. The next paragraph is mostly the same statistics that have been endlessly repeated in every article on the subject, except that it starts by claiming that 95% of New Zealand’s dairy produce is exported. Really? My impression was it was closer to 80%, but whatever, either way it’s a huge amount. At present the biggest problem is that there is absolutely no international standard for the testing of DCD, there’s only a few countries like the USA who have put DCD on the list of things that must be tested for in food products, which means it’s already treated as a dangerous product, and China should do the same as soon as possible. Ah, melamine. The grandmother of all dairy product safety scandals. And when asked if a similar problem could occur in China, Nan says there’s no need to worry, because most Chinese pasture is still in its original state and fertiliser is not generally used, and in any case, not all fertiliser contains DCD. So, to sum up, a nice looking headline, but New Zealand milk – polluted. Chinese milk – safe. I hope Fonterra finds that reassuring – don’t worry, New Zealand has competition, there are other sources of milk out there. And, oh boy, does this reek of puff piece, but it’s highlighting another source of quality milk for those worried about the safety of New Zealand produce. The Netherlands. It starts off trying to explain how the fact a quarter of its land is below sea level and so much of its pasture has been reclaimed from the sea makes the Netherlands’ pasture extremely good. I don’t get it, but whatever, there might be some truth to that. Then it explains that infant formula production is done under the regulations for producing medicine, and so formula is tested much more often through the production process than formula in other countries, and it meets the EU’s tough quality standards. It then says that electricity is the main power source, and wind the main source of Dutch electricity, so the Netherlands’ air quality is good. Of course, it doesn’t mention that the Netherlands is downstream of neighbouring Germany, and not terribly far from the heavy industrial Ruhr, but nevermind. It goes on to point out that the Netherlands is one of the few countries to be free of all common communicable cattle diseases. So, if we trust People’s Daily, next time we hear clean and green or 100% pure, we’re supposed to think of windmills, tulips, polders and canals, it seems. I wonder if Fonterra has any plans to fly Chinese journalists to New Zealand, take them on tours of the dairy farms and factories of the Waikato talking about how clean and safe the milk powder production process is, then stand them on the beach at Raglan and politely suggest that while the Netherlands has heavy industry very close to its dairy farms, it’s a hell of a long way from New Zealand to anywhere else. Just don’t let them see the state of New Zealand’s lowland waterways. 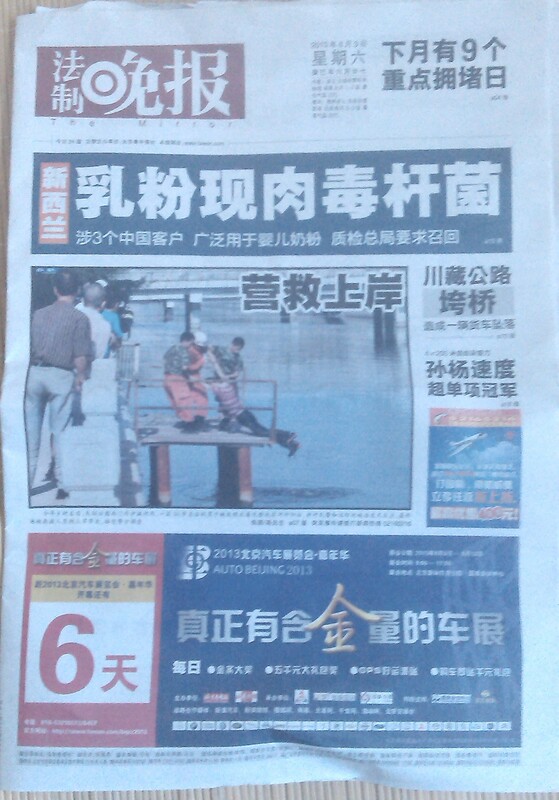 On my way to lunch I bought a copy of Beijing Youth Daily, and on the front page was this rather short article. AQSIQ has issued a new regulation, to come into effect on May 1 this year, stating that the importer should voluntarily recall imported dairy products with safety issues, whether they’ve already harmed people’s health or could pose a risk to their health. Also, it bans dairy farmers exporting to China from using feed, feed additives, veterinary medicines and other chemicals harmful to animal or human health banned in either China or the exporting country or territory. Also, AQSIQ will be able to issue warnings and notices of threats to dairy product safety and take conditional measures, such as increasing the strictness of testing and ordering recalls. Which looks good, but I still can’t see what Fonterra is doing to persuade China that the DCD contamination really was so minor and is all fixed and its products really are safe. Instead, I search the New Zealand Herald and find an article from Wednesday reporting that Westland Milk Products found traces of DCD in some of its products produced before November 1. The tests revealed minute traces of DCD in samples of Westland products produced before November 1 last year. The evidence indicated products made after that date are free from DCD, the company said. Westland is conducting further testing in line with customer and government requirements and said it would announce the results as soon as possible. Fine, but I would like to know when the testing was done and how soon after DCD was found in Fonterra products Westland found out. Westland’s website looks pretty, but doesn’t seem to work too well, and searching it for “DCD” didn’t turn up much of anything. A University of Otago study has found dicyandiamide (DCD) residues in streams in Otago’s lower Taieri Plain in concentrations that cause natural nitrogen transformation processes to be disrupted in aquatic ecosystems. Department of zoology researcher Marc Schallenberg conducted laboratory experiments showing that in a wetland system, the presence of DCD inhibits the processes of nitrification and denitrification – two natural processes that help to purify and detoxify waters. “While DCD’s inhibition of nitrification on land is desirable as it reduces the amount of nitrate entering streams, its similar inhibitory effects within aquatic environments is undesirable, as this could lead to ammonia toxicity in fish and other species, or increased incidences of algal blooms,” Dr Schallenberg said. And that, sadly, is about all the detail the article gives. The rest is either introduction or more mindless repitition of what we already know. I guess its good for New Zealand’s river systems that DCD has been withdrawn, even though it was used to prevent nitrate leaching into the rivers, but I wonder how long the contamination will persist. I guess rivers, being flowing things, will gradually flush the DCD out, but how long will it take all of the DCD to leach out of the soil and be washed out into the sea? Tourism NZ chief executive Kevin Bowler said New Zealand had to be very careful about its reputation. “We need to follow up really good practices around protecting our environment because it’s such an important part of why visitors choose to come here. Obviously none of those stories are particularly helpful to us,” he said while commenting on figures which showed a dip in the number of overseas tourists during the past year. Yes, absolutely. Because people are let down by the difference between the hype and the reality. I’ve probably told this story a gazillion times, but whatever, years ago I met two Belgian friends of a friend and showed them around Wellington for a couple of days. They told me, “You know, the way you Kiwis treat the environment, if you had the population density of Belgium, your country would be a toxic waste dump”. And they were right. And so was Fred Dagg – we don’t know how lucky we are. It really is the lack of people that keeps New Zealand as clean and green as it is, and as New Zealand’s population continues to grow, if we want our kids and grandkids to run around on beaches and in parks barefoot like we used to do (probably still do, many of us – when she got back from her first trip to New Zealand my wife told all her friends and family about me wandering around with no shoes on) then we really need to improve the way we treat our environment. And if we want to keep our tourism industry and our food exports, we need to treat our environment better, because tourists going home and telling their friends and family that that 1oo% pure thing is a load of nonsense and food safety scandals really does make people think twice about visiting New Zealand or buying our produce. So, Fonterra, where are you? What are you doing to persuade your formerly devoted Chinese customers that your products are pure and safe? Why am I not seeing any evidence that these efforts of yours are working? Nope, this scandal isn’t just going away, and I really hope Fonterra and MPI are paying attention, because so far they don’t seem to have handled things terribly well. What do I find on Hexun today? A suggestion that perhaps Chinese dairy companies might be rethinking their plans to build milk powder plants in New Zealand, and more on the drop in sales, especially online, of New Zealand made infant formula. Although I also note that both articles also have an ad for imported infant formula, including New Zealand’s Karicare, at the bottom. Let’s start with the second one first. It’s a repost of a Beijing Daily article. The reporter went to several large supermarkets around Beijing and saw that New Zealand made infant formula was on the shelves in its usual prominent space and apparently selling as normal. Online, however, it’s a different story, with New Zealand infant formula purchasing agents on Taobao having lost half their business and many parents saying they were not giving their children New Zealand infant formula for the time being. The figures given for the drop in sales on Taobao are 50.9% over the last 7 days and 61% compared to the same period last year. A purchasing agent specialising in imported infant formula said that sales had dropped by half and many buyers were now buying North American, Japanese or Dutch made infant formula. Up till now the supermarket still hasn’t received any notice to take it off the shelves. Lately fewer people have come to buy, but we haven’t received any notice to take products off the shelves or recall them. To me it’s almost as if the reporter was expecting to find New Zealand infant formula off the shelves or hidden away or supermarkets ordered to stop selling it, and is surprised to see it still there as per normal. I was just in one of my local supermarkets, and I saw nothing unusual about the infant formula display, but I didn’t see any prominent mentions of New Zealand, either. And now the first one second. This one comes from The Beijing News, and in the paper edition is a full page with an interesting image at the top – two Friesian dairy cows with targets on them and “二聚氰胺” (DCD) repeated in various sizes in the background. Right when domestic consumers were seeing New Zealand as the “Pure Land” of milk production, the crisis broke out. Tempted to write “Land of Milk and Honey” for “Pure Land”, as that would seem to be pretty close to the intended meaning (especially when look at the prices manuka honey is going for on Taobao and the likes….. no, don’t jinx NZ, we don’t need a contaminated honey crisis, too). This news unexpectedly made Yili and Yashili, who had only recently announced they would build plants in New Zealand, “collateral damage”. On the day [the day the news broke], Yashili’s share price plummeted. And industry insiders said the DCD incident could well influence domestic enterprises plans to build plants in New Zealand. On this, Yili chose silence. Yashili said that its plans to build a plant in New Zealand would not be affected by this incident. Although I think New Zealand has far too many of its economic eggs in the dairy export basket, it would be disappointing to see Yashili and Yili choose to build their plants elsewhere. Why? They were each planning to invest 1.1 billion yuan in these plants, with Yashili building in Waikato and Yili in South Canterbury. That’s money, jobs, and not helping further concentrate all of New Zealand into Auckland. Not that there’s anything wrong with Auckland (apart from its woefully inadequate public transport, of course), but the rest of the country needs some love, too. And I don’t see the sense, given New Zealand’s geological wobbles, of concentrating everything in one city – in Auckland’s case, in one city built on a volcanic field that will one day erupt again. Spreading things out so that one natural disaster (well, one smaller than a possible future eruption of Lake Taupo, at least) doesn’t wipe the entire country out seems to make much more sense than me. So, sure, Yili and Yashili’s investments, if they win the necessary approvals and aren’t scared off by the DCD and go ahead, will help cement New Zealand’s reliance on dairy exports, but at least they’re giving the provinces some much needed love. There were media reports on January 28 that Mengniu recently spent a large sum of money buying in 3000 head of pure Holstein dairy cows in the hope of improving the quality of its milk. Cos we can’t trust those Kiwis to not go spraying chemicals on their grass, but we can buy their cows. Right? Fair enough, under the circumstances. Apart from public perception and cost, building a plant in New Zealand has tax benefits. Yili says that China and New Zealand have already signed a Free Trade Agreement, and in 2020 import tariffs on dairy products will be cut to zero, increasing the company’s profitability and having a positive effect on strengthing the company’s competitiveness. So let’s settle this DCD issue and get things back on an even keel, because if Chinese dairy companies have such strong reasons to invest in New Zealand, and by doing so they can create jobs and break Fonterra’s stranglehold, then surely everybody but Fonterra wins? And, personally, I’d be quite happy to see Fonterra taken down a peg or two, so bring it on. But after the melamine, Mengniu milk testing positive for excessive levels of the carcinogen aflatoxin M1, and abnormal mercury levels in Yili milk powder scandals of recent years, domestic consumers, when faced with dairy product safety problems, are already as skittish as sheep. So worried! Exactly which milk powders have tested positive for DCD? Precisely. Because neither MPI nor Fonterra has bothered to tell anybody which batches of which products tested positive, all New Zealand milk powder is under suspicion. If they’d tell us which batches were relaxed, then people could check, then either dump any dodgy stuff they have or relax. Song Liang believes that if you want to know whether a dairy product is safe or not, you need to look at how mature the country’s production supervision system is, and in this respect, New Zealand is certainly trustworthy. At the same time he said this incident gave Chinese consumers a warning that one can’t blindly worship western brands, no country’s milk powder is absolutely safe. Well, true, but MPI seems to have dropped the ball on this one, at least on the PR front. How different would things have been if back in September last year they’d announced precisely which batches of infant formula had tested positive for DCD? So, I dunno, I can’t see from this article that there is an imminent risk of Yili or Yashili pulling out of their planned investments in New Zealand, and there are clear positives to Chinese investment in New Zealand dairy, but I do see a definite risk of, if MPI and Fonterra don’t get their acts together and start handling this situation properly, serious damage to New Zealand’s dairy exports being done.